1) Uses the new material and the spatial crossing linking technology, high absorbability, high water resistant, anti-mildew and long service life. 3) The product involves surface active agent, absorb water naturally, fast speed of pervasion, lasting effectiveness. A piece of water can diffuse in 4-5 seconds. Height of absorb water: 60-70 mm/5 seconds, 200mm/1.5 hours, can achieve international standard. 4) Variety size of shape: Galvanized sheet, Stainless steel, Aluminum panel and so on, satisfy the needs of customers. 5) The product does not contain phenol which is irritant to the skin and the like chemical products. It is harmless and poise less while installation and using. It is safe, energy saving, environmental protective, economic and durable. 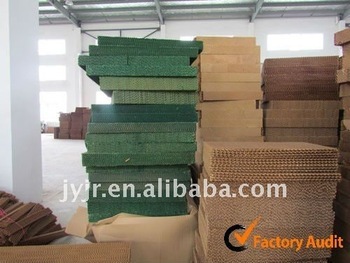 Our company can supply many kinds colour of the cooling pad, such as brown, green, black, yellow, yellow and green and so on. Welcome customers to visit our factory and place the order.